Samsung Galaxy Note 3 GiveAway! Enter NOW! Can't afford Samsung Galaxy Note 3? Hmm. You are at right place. We are holding a Samsung GiveAway for our new forums. The forums are new so we want users to register with us. For this, we planned to hold a GiveAway so even users can enjoy the GiveAway. Samsung Galaxy Note 3 is the most powerful Samsung device with tons of features. Here we will discuss features of Samsung Galaxy Note 3 as well as of the GiveAway. 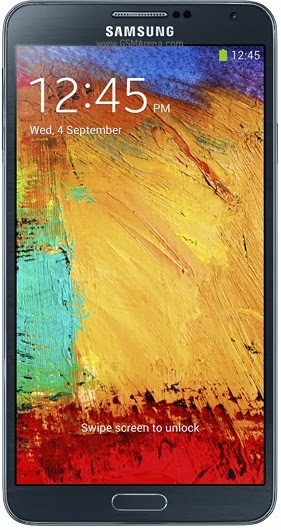 Samsung Galaxy Note 3 is a phablet with a big 5.7 inch of capacitive touch screen which supports capacitive touch. It has a Super AMOLED capactive touch screen protected with Corning Gorilla 3 glass. The device gives full HD display of 1080 x 1920 pixels. You can use S pen stylus with this device so you can actually draw a sketch on this device. The device has 13 Mega Pixels rear-camera which allows you to capture some crisp photos and record HD videos at 1080p HD with 4128 x 3096 pixels. You get great video output of 2160p with 30 FPS and 1080p with 60 FPS. There's also a secondary camera of 2 Mega Pixels, and that can also record HD videos at 30 FPS. The phablet runs on Android 4.3 Jelly Bean but can be upgraded to Android 4.4.2 Kit Kat latest Android OS by official Samsung OTA. The model we are offering is N9000 which has an Octa-Core processor. The two chipets are Quad-core 1.9 GHz Cortex-A15 and another quad-core 1.3 GHz Cortex-A7 chipset. Boosted by Exynos 5 Octa 5420 processor, you can run your any android game or application. To satisfy the processor, there is 3 GB RAM which is the highest RAM added to any android mobile phone ever. Because it is a phablet, you can message, text and contact your dear ones too. You can run internet faster in it because it has 42 MBPS internet speed. Latest Bluetooth v4.0 allows you to transfer your files 4x faster than the normal bluetooth. Not only the speed is boosted, it also consumes less battery than the normal bluetooth (v3 or older). For better gaming and video experience the device is stuffed with Mali-T628 MP6 chipest and believe me, it is better than Adreno 330 chipset. The browser supports HTML5 which is the latest technology available right now. Also you can command your Note 3 with S-Voice! So when your hands are dirty, just command your mobile phone to do that work for you. Because it has cool features, the battery backup or the juice is also better than Micromax and other Indain devices. You get a Li-on 3200 mAh battery backup in this device. Now, no more of this device and let's talk about the GiveAway! The contest is for all around the world. If because of some problems we cannot send Note 3 to your home place then we will send money equal the the value of the device. The winner will be annoucned after 30 days. Anyone can take part in the Giveaway. No age restrictions. Anyone from anywhere in the world can participate in this competition. NO CHEATING IS ALLOWED. If you will cheat with us, then lose all the hops of winning. We are a lot smarter than you. NO fake IDs to be registered with us. If we saw anything wrong, it will result with a BAN. The points will increase as soon as you will do the next step. If you will skip anything thinking that you will fool us then you are wrong! Selection of the winner would be automatically. We cannot control it howsoever so don't think we will cheat with you. The device will reach to you after 30 days of the dispatch. Winners would be contacted directly via Email or any other source. Click here to visit the GiveAway site.